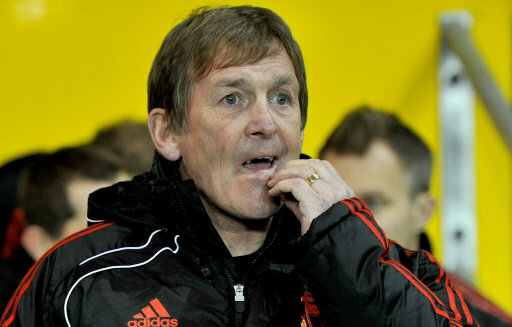 Newly-instated Liverpool messiah Kenny Dalglish has scheduled a meeting with the club’s American owners (including owner John Henry, who flew in from the States on Tuesday) later today, and the national press have had a field day ruminating over the fact that the Scot may use the opportunity to ask for a scheisse-load of cash to spend on a scheisse-load of players. The Daily Mirror are leading the line, suggesting that Dalglish will plead with Henry for the funds to bring in a ‘midfield enforcer’, as well as £10 million-rated Southampton prodigy Alex Oxlade-Chamberlain (though Arsenal are thought to be closest to tying up a deal for the 17-year-old) and a couple of ‘experienced forwards’ to be bought in during January. And just who, pray tell, are these ‘experienced forwards’ of which you speak? Well, the Mirror are readily proffering forth the names of Ajax’s toothsome striker Luis Suarez, jinky Dutch winger Eljero Elia, Wigan upstart Charles N’zogbia, Chelsea’s Daniel Sturridge and CFR Cluj’s imposing target man Lacina Traore – with West Ham loanee Victor Obinna tacked on the end of the list via a separate report. As for the midfield enforcer, it seems that it will either be Dutch destroyer Mark van Bommel, Sunderland’s resident red-card magnet Lee Cattermole, West Ham action hero Scott Parker, leggy Wigan powerhouse Mohamed Diame or Real Madrid’s Lassana Diarra that is bought in to ride shotgun alongside Steven Gerrard. Oh, and just for good measure, the Daily Telegraph reckon that King Kenny will also push for the signing of Ajaz left-back Urby Emanuelson. Dozen? Baker’s dozen? Who’s counting? Either way, it looks like the Fenway boys are going to put in one hell of a shift over the next few weeks! That’s an imposing list of lads that no doubt would be of help to Liverpool. Any of them would be acceptable to me. All of them would truly be a dream! A left sided midfielder should be a priority. Maybe the same for the right too, but I’d like to see Johnson given a chance there first. I’m not sure that a central midfielder is too vital, as I think Lucas-Meireles with Gerrard ahead of them is pretty solid. Any chance of getting Aqua and Insua back? elias, suarez, diarra…throw in a good left back and things look much better. not going to happen though. Eljero Elia is his name. Sorry to correct. Elia would be a gutsy yet extremely acceptable signing. He’s young, quick and has dribbling skills á la Messi. @MaxMad: Oops, cheers for the heads-up dude. Don’t know how that extra ‘s’ snuck in there! Elia is having a really poor season so I can’t see why we should buy him. Suarez just got himself banned for seven or so matches because of biting an opponent. Do we want that kind of player? N’Zogbia is kind of a money-grabber. He surely would come to LFC but would it be for wearing the shirt of for grabbing handsome money. I’d guess it’s the latter. And we have enough mercenaries on our books already. What we really need is a proven striker and some flair-players. Funny how the most-linked players don’t get mentioned: Turan, Honda, Young. As a result of this I think that list is not Dalglish’s list but some made-up stuff from some journo. ashley young or elia for left side. Suarez is a no brainer up front. Our central midfield is shocking. Miereles is scared of a tackle. Embarrasing. He will do rubbish on sunday in the derby. M’vila, moussa sissoko, arturo vidal or diarra to replace miereles and poulsen. A left back is a must. Santon can play both flanks. would be great. Play kelly. Try johnson right wing. Wont happen though. Liverpool are takin too long again in the window. Should have full reports by now of players on their shortlist. Half the season is done. @ anteater, this is exactly the time that we should be picking up such players – while they are temporarily having a bad time and their reputation (and value) is low, rather than spending the maximum amount on an average player that has just hit a hot streak. Suarez would do us fine. Diarra? The last thing we need is centre-mids. We need width, which N’zogbia would bring. Out of that list that’s about it. Can’t believe that nobody , even KK is looking at 2 mean centre halfs. They’re shipping easy slack goals and don’t impose themselves or strike fear into centre forwards. I think ma maw could take the ball Kiri. He needs to bin at least 5 in this window before he could buy/bring in any of the above. Poulsen , Lucas , Johnson, Konchesky, Kiri , Babel are just not LFC standard. @ Jay Wright. In a way you are right, but as far as reports are to be believed they (Hamburg) are asking for a fee that does not reflect that the lad is having a stinker of a season. Why pay a premium for someone who is (currently) unable to deliver? @ Gibby. Good point. Our centre-halves didn’t perform anywhere near the required standard this season and at least half of last season. This surely has to be addressed. Regarding your list of players who are not LFC standard, well, you could add almost our entire squad to that list. At least if we want to get back into the top four. A midfield enforcer should be the priority. Teams are running through us. The reason that we are 13th and not 6th is the number of goals that we are conceding, not a problem with goals scored. Yes, we need wide players and another striker, but our priority is strengthening, physically as well as in quality, the midfield. Lucas is more a playmaker type, not a tackler. Poulsen is too slow and too weak. Meireles is too weak and more offensive. Gerrard is injury prone and wouldn’t stay back. Cole is an attacking midfielder. We need a replacement for Mascherano and maybe our midfield would not look so bad. I’d settle for Van Bommel till the end of next season, won pretty much everything, gets stuck in and can pass the ball. Otherwise, would be happy to see Parker come in, although he seems to get forward for West Ham. Not sure about Diarra, Momo Sissoko has the energy to come back and do a job, the rest are players that might take time to get used to the league, and we can’t take any risks. It’s unlikely we’ll be allowed to sell Konchesky as he played one game for Fulham. p.s. I keep saying it, Centre back, why haven’t we made a bid for Wheater from Boro? What’s going on with the youth system ? Surely they must’ve seen about 4-5 years ago that Carragher wouldn’t last for ever but if they could grow/cultivate another English player into a good old fashioned CH by playing them along side JC. Who was the lats player to come through the ranks ? Don’t get me wrong this isn’t just LFC but that city has produced some great talent through the years and surely the system in place is supervised or known to King Kenny. Cattermole? Away and take your face for a shite. I think our midfield is poor Lucas has developed into good defensive midfielder but his passing is not very good as for Meireles is concerned he is one dimensional player and can play at one pace only , cannot control the game and is inconsistent. This season Liverpool’s midfield has not been able to manage more than 50percent possession against lower teams also this shows our poor midfield. We need to bring Aquilani back or buy Banega and Sahin. We need wingers and striker also Arda Turan, Ashley Young, Nzogbia, Hazard, Suarez, Gervinho are some good choices. We need to buy atleast 4 players among them then we might finish at respectable position and maybe challenge for league next season. take the chance on elias or buy ashley young either can play on the left, play johnson at right midflied, if liverpools gonnna fork out 20 million it should be on coentrao. also they should play babel beside torres, i think once they get used to play with eachother the would be fine and lastly i think we should sign curtis davis as the person above me said, i remember couple of years ago we were tracking him pretty hard. Give Kenny 40M. Offload Konchesky(3.5M), Poulsen(5), Maxi(9), Babel(6), Jovanovic(7.5M) and Kenny gets a total of 40M + 31M = 71M to bring in quality players. I say we should get FABIO COENTRAO(10M), MARKO MARIN(15M), JAVI MARTINEZ(15M) and LUIS SUAREZ(22M). Lastly, give Insua+9M to Galatasaray in exchange for ARDA TURAN. to the list and try and get a bit of dough for them then buy a decent CH ! Reina needs protection or he’s gonnae walk. I still go back to the fact that they’re must be youth coming through at LFC. If not then who’s the chief scout and reserve coaches ? It’d save them having to shell out millions for dudds like Johnson who can’t defend for his life. EPL needs to start promoting home grown talent or the national team will never improve. Too many average foreign players taking money out the english game giving 50% effort week in week out back for the fans……..they don’t give feck about the man in the KOP ! We need players in wide areas. We haven’t had any decent width for as long as I can remember. We seem to be strong through the middle with Reina, Agger, Skrtel, Gerrard, Meireles, Torres. Quality and pace in wide areas must be a top priority. Lol. Is there a single poster above who ain’t basing their knowledge on fm11? Yeah I love it too but at least I can separate it from real life. It’s not really that easy! Rogue, are you serious with those prices? You’d be lucky to get 15 between those players.